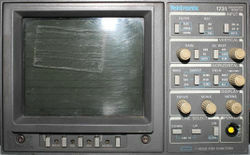 The Tektronix 1731 is a Television Waveform Monitor for the PAL video standard. The 1730 is the NTSC and the 1735 is a multi-standard sister model. The 1731 can be coupled to a 1721 Vectorscope, they can be mounted side-to-side in a 19" rack using option 1700 F 05.